I have read a few books that talk about the life of the author but this book was slightly different as it was a dedication to Alison's mother! 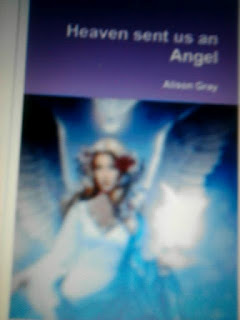 The book follows Alison from a young child till the present day.It describes the struggles of her mother, the story starts when Sylvia Grey tells Alison she is pregnant with her 3rd child. it follows her struggle to deal with the death of her son Ashley, care for her parents, care for her daughter after a accident, care for her dying husband and looking after her son who was born with cerebral palsy, hearing and sight problems. sadly Sylvia Grey dies of heart failure and this book shows her struggles and what a loving mother she is, it also shows how a evil (her words not mine) selfish child can mature in to a loving and selfless woman when faced with losing both parents and being left responsible for her younger brother. I have to say i wasn't sure about this book. Alison is a lovely person but i wasn't sure i would be about to read such an emotional story without getting upset or feel like i was intruding on someones most personal moments! I am glad i kept reading! This story was very emotional for me and i found i connected with the story straight away as it happened practically on my door step. Alison's nana reminded me of my nana the way she had to feed everyone, look after everyone and would do anything to help her family. in a way this story was upsetting for me because it reminded me so much of my nana and highlighted all that i have lost but in another way it made me smile because it reminded me of her so bad and Alison shows how you can come out the other side of losing someone close to you! Alison also pointed out that elderly people although it is still not easy saying good bye have lived an exceptional life and have achieved everything they wanted!so in away this book was emotional for me as it reminded me of the death of my nana and cried when Alison's nana and mam died! but also made me smile at the stupid things the people in the north do. If you are not from the northeast of England you may not understand some of the phases used in the story. It does take a few chapters to get in to the story as it jumps around in time for a while to set the seen for the rest of the book so you have to follow the book carefully to keep up. There is a few spelling mistakes but that can be cover looked by the emotional story.